When it hits 100 degrees outside, you need a cold drink. 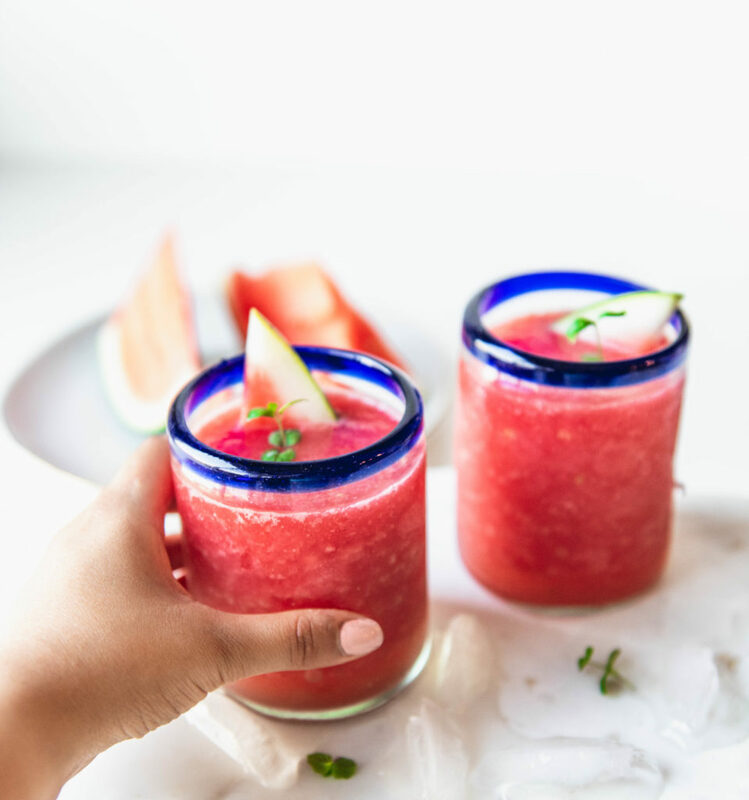 Our favorite way to cool down in the summer is with these super easy watermelon slushes! Nick grew up drinking these as a kid, and of course as an adult has turned them into the most refreshing summer *cocktail*! FYI he calls the adult versions, “Watermelon Booze”. Yep, that’s my husband. 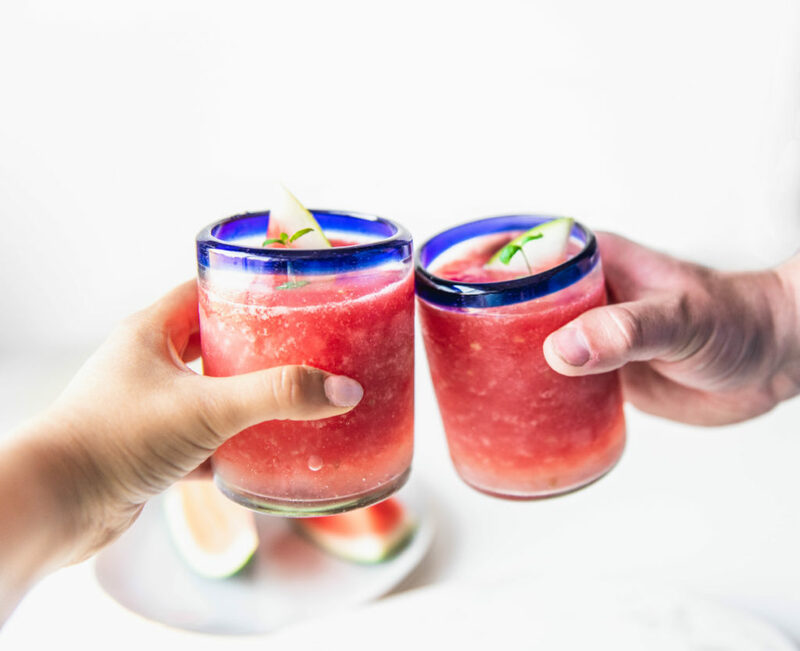 These slushes are super easy to make – especially if you have the main ingredient – frozen watermelon – on hand. 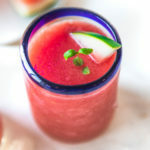 I try to freeze half a watermelon every time I cut a large one so it’s easy to make a watermelon slush whenever you want one! Harper loves frozen watermelon too – it’s a great low cal dog treat during super hot summer days! #versatile. Of course you can make these slushes kid friendly. Just swap out the triple sec for orange juice and skip the tequila! For the boozy adult version, you can use white rum if you’re in the mood for a mojito flavor or tequila if you want to go more the direction of a margarita. These are also super fun to make in advance and freeze into popsicles! Muddle the mint, spirits, and lemon juice. 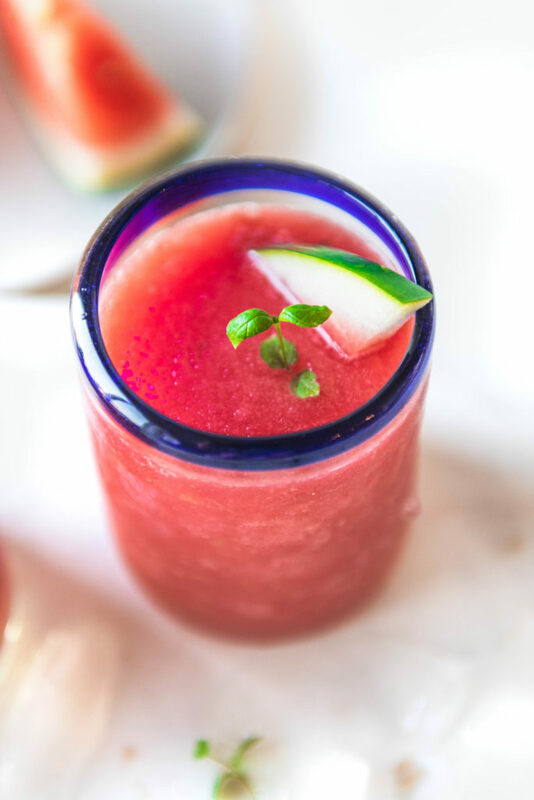 Put the frozen watermelon in a blender. Strain the mint and spirit mixture into the blender. Blend until a slushy consistency. Serve with a wedge of watermelon and some mint! Got a favorite summer cocktail? Share it with me in the comments below! !